Herrmann began his career in theatre. One of the first professional productions he appeared in was the U.S. premiere of Michael Weller's Moonchildren at the Arena Stage in Washington, D.C., in November 1971. He moved with the show to New York City to make his Broadway debut the following year. Herrmann returned to Broadway in 1976 to portray Frank Gardner in the revival of Mrs. Warren's Profession. For his performance he won a Tony Award for Best Featured Actor in a Play. Herrmann was known for his portrayal of Franklin D. Roosevelt in the made-for-television movies, Eleanor and Franklin (1976) and Eleanor and Franklin: The White House Years (1977) (both of which earned him Best Actor Emmy Award nominations), as well as in the first feature film adaptation of the Broadway musical Annie (1982). Herrmann portrayed Herman Munster in the Fox made-for-television film Here Come the Munsters, which aired on Halloween, October 31, 1995. In 1980 Herrmann also starred in an episode of M*A*S*H as an army surgeon suffering from PTSD. 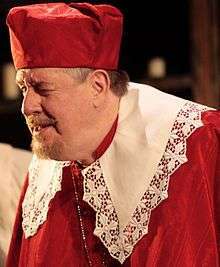 He was nominated for a Tony Award for Plenty in 1983 and Emmy Awards in 1986 and 1987 for two guest-starring appearances as Father Joseph McCabe on St. Elsewhere. He played Tobias Beecher's father on Oz. Herrmann earned an Emmy in 1999 for his guest appearances on The Practice. From 2000-07, he portrayed Richard Gilmore on The WB's Gilmore Girls. Herrmann's film career began in the mid-1970s, playing supporting roles as Robert Redford's partner in The Great Waldo Pepper, a law student in The Paper Chase, the idle, piano-playing Klipspringer in The Great Gatsby and opposite Laurence Olivier in The Betsy (1978). He again portrayed President Roosevelt in Annie. Herrmann played the lead in the 1979 Kieth Merrill movie, Take Down, in the role as the high-school English teacher turned wrestling coach. Among Herrmann's better known roles are as the title character in another Kieth Merrill film, Harry's War (1981), Goldie Hawn's gold-digger husband in Overboard, Reverend Michael Hill in Disney's The North Avenue Irregulars, one of the characters in the film-within-a-film in Woody Allen's The Purple Rose of Cairo, and as Max, the mild-mannered head vampire in The Lost Boys. Herrmann also had a supporting role as William Randolph Hearst in the 2001 film The Cat's Meow, starring Kirsten Dunst as Marion Davies. Herrmann was known for his voluminous voice work for The History Channel and various PBS specials, including hosting a revival of Frank Capra's Why We Fight, and made appearances and did voiceovers in Dodge commercials from 1992 to 2001, and Rayovac batteries in the same timeframe. His voice work includes dozens of audiobooks, for which he won several Audie awards. He played Gutman in Blackstone Audio's Grammy-nominated dramatization of The Maltese Falcon and played Cauchon in Blackstone's audio version of Bernard Shaw's Saint Joan. After his well-received portrayal of J. Alden Weir in the play My Dearest Anna at the Wilton Playshop in Wilton, Connecticut, he was a special guest of the Mormon Tabernacle Choir and Orchestra at Temple Square in their Ring Christmas Bells holiday concert in Salt Lake City, Utah, December 11–14, 2008. He reprised his role of Franklin Roosevelt in 2014, providing the voice of F.D.R. in Ken Burns' PBS series, The Roosevelts: An Intimate History. His final work was as narrator for another Burns documentary, Cancer: The Emperor of All Maladies, which aired three months after Herrmann's death. Herrmann came from a prominent Unitarian family, based in Grosse Pointe, Michigan. He became a Roman Catholic as an adult. Herrmann was married twice and had two daughters, Ryen and Emma. In 1978, he married his longtime girlfriend, screenwriter Leigh Curran. The marriage ended in 1992. Prior to his second marriage, Herrmann's future second wife, Star Roman, filed a paternity suit against him after he fathered a child with her while filming Harry's War (1981). Roman and Herrmann eventually married, and the union lasted from 1994 until his death in 2014. Herrmann had one stepson, Rory Herrmann, Star Roman's son from a previous relationship  who, as an adult, changed his last name from Roman to Herrmann in honor of Edward Herrmann. Rory is currently serving as director of culinary operations for Bill Chait's Sprout Restaurant Group in Los Angeles. Herrmann was a well-known automotive enthusiast and restored classic automobiles. Herrmann was a regular master of ceremonies for the annual Pebble Beach Concours d'Elegance and hosted the television show Automobiles on The History Channel. He owned and restored several classics of his own, including a 1929 Auburn 8-90 Boattail Speedster and a 1934 Alvis Speed 20. Herrmann died on December 31, 2014, at Memorial Sloan Kettering Cancer Center Hospital of brain cancer, at the age of 71. In December 2014, it was reported that Edward and Star Herrmann had filed a lawsuit against their accountants, CohnReznick, seeking $14.5 million that they allege had been misappropriated. The suit was later dismissed. CohnReznick's attorneys claimed, "This action will be revealed for what it is — a last-minute, unfounded money grab by Star Herrmann, Edward Herrmann’s widow, who is looking for any source of income to account for her decades of rampant overspending and her penchant for living well beyond her means, all of which defendants repeatedly advised against for years and which was recently exacerbated by Mr. Herrmann’s unfortunate health problems, necessary medical expenses and untimely death. 1 2 Ollove, Michael (July 26, 1996). "As Time Goes By, History Channel Blossoms". The Baltimore Sun. Retrieved February 9, 2014. ↑ "NOVA and Science: Submarines, Secrets and Spies". Public Broadcasting Service (PBS). Retrieved February 9, 2014. ↑ Cantwell, Julie (September 18, 2000). "Dodge turns 'cool' in ads". Automotive News. Retrieved February 9, 2014. ↑ Bourne, Kay (March 11, 2009). 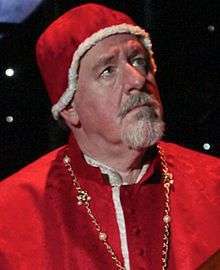 "Edward Herrmann Dons Pope's Garb in New Play". EDGE. Retrieved February 9, 2014. ↑ Edward Herrmann profile, FilmReference.com; retrieved December 31, 2014. ↑ Willis, John (2003). Theatre World 1999-2000 Volume 56 of THEATRE WORLD. Hal Leonard Corporation. p. 217. ISBN 1557834768. ↑ Blaney, Retta (2003). Working on the Inside: The Spiritual Life Through the Eyes of Actors. Rowman & Littlefield. p. 46. ISBN 0742533190. ↑ Guernsey, Otis L. (1987). Curtain Times: The New York Theatre, 1965-1987. Hal Leonard Corporation. p. 218. ISBN 0936839244. ↑ Nemy, Enid (October 4, 1985). "Broadway". The New York Times. Retrieved 9 February 2014. ↑ Canby, Vincent (April 13, 1979). "Movie Review The: North Avenue Irregulars (1979)". The New York Times. Retrieved 9 February 2014. ↑ Pederson, William D. (2001). Franklin D. Roosevelt and the Shaping of American Political Culture, Volume 1. Armonk, New York: M.E. Sharpe. p. 34. ISBN 0765606208. ↑ Cox, Stephen (2006). The Munsters: A Trip Down Mockingbird Lane. Random House LLC. p. 142. ISBN 0823078949. ↑ Lawson, Carol (May 17, 1983). "'CATS' Leads in Tony Race, with 11 nominations". The New York Times. Retrieved February 9, 2014. ↑ "Edward Herrmann". Academy of Television Arts & Sciences. Retrieved February 9, 2014. ↑ Van Gelder, Lawrence (January 27, 2003). "This Week". The New York Times. Retrieved February 9, 2014. ↑ "HBO and David Kelley Win Top Early Emmys". The New York Times. August 30, 1999. Retrieved February 9, 2014. ↑ Canby, Vincent (March 14, 1975). "Movie Review: The Great Waldo Pepper (1975)". The New York Times. Retrieved February 9, 2014. ↑ Canby, Vincent (October 17, 1973). "Movie Review: The Paper Chase (1973)". The New York Times. Retrieved February 9, 2014. ↑ Canby, Vincent (March 28, 1974). "Movie Review: The Great Gatsby (1974)". The New York Times. Retrieved February 9, 2014. ↑ Maslin, Janet (February 10, 1978). "Movie Review: The Betsy (1978)". The New York Times. Retrieved February 9, 2014. ↑ Maltin, Leonard (2008). Leonard Maltin's 2009 Movie Guide. Penguin. p. 585. ISBN 0452289785. ↑ Maslin, Janet (December 16, 1987). "Film: 'Overboard,' Comedy, With Goldie Hawn". The New York Times. Retrieved February 9, 2014. ↑ Canby, Vincent (April 13, 1979). "Movie Review The North Avenue Irregulars (1979)". The New York Times. Retrieved 9 February 2014. ↑ Canby, Vincent (March 1, 1985). "Movie Review: The Purple Rose of Cairo (1985)". The New York Times. Retrieved 9 February 2014. ↑ James, Caryn (July 31, 1987). "Movie Review: The Lost Boys (1987)". The New York Times. Retrieved February 9, 2014. ↑ Lawler, Sylvia (September 22, 1991). "Special Takes Fresh Look At Pearl Harbor". The Morning Call. Retrieved February 9, 2014. ↑ "Brian Stokes Mitchell and Edward Herrmann Join Mormon Tabernacle Choir for Annual Christmas Concerts". The Church of Jesus Christ of Latter-Day Saints Newsroom. October 21, 2008. Retrieved February 9, 2014. ↑ Lowry, Brian (September 10, 2014). "TV Review: The Roosevelts: An Intimate History". Variety. Retrieved October 24, 2014. ↑ Edward Herrmann conversion to Catholicism, catholic.org; accessed January 3, 2015. ↑ Notice of death of Edward Herrmann, starpulse.com; accessed January 3, 2015. ↑ Tomicki, Hadley. "Rory Herrmann Exits Bouchon Beverly Hills". Vox Media Inc. Retrieved February 9, 2014. ↑ Taylor, Dennis (April 12, 2014). "Pebble Beach Food & Wine celeb chefs like kids in candy store". Monterey County Herald News. Retrieved April 20, 2014. 1 2 3 Stenquist, Paul (March 5, 2010). "An Actor Takes His Place on a Stage of a Different Sort". The New York Times. Retrieved February 9, 2014. ↑ Scanlan, Dan (March 12, 2001). "Amelia Island Concours d'Elegance ends with style". The Florida Times-Union. Retrieved February 9, 2014. ↑ Oldenburg, Ann (December 31, 2014). "'Gilmore Girls' actor Edward Herrmann dies". USA Today. ↑ "Edward Herrmann: Actor Demands Whopping $14.5 Million From CohnReznick In Mismanaging Money Lawsuit", inquisitr.com; accessed December 12, 2014. ↑ "Actor Edward Herrmann says accounting firm owes him $14.5 million after they mismanaged his money: suit", nydailynews.com; accessed December 12, 2014. Wikimedia Commons has media related to Edward Herrmann.